The Painted Trillium is one of the prettiest wildflowers in the Smokys. This one grows wild along the Oconaluftee River (Beech Flat's Prong across 441 from the Kanati Trail) on the Cherokee side of the Smokys. It is a small trillium and can be easily overlooked. Please be careful watch your step in this garden. This season the trail is closed until the landslide repairs are done on US 441. The Painted Trillium here will likely be done by the time 441 and related trails reopen. 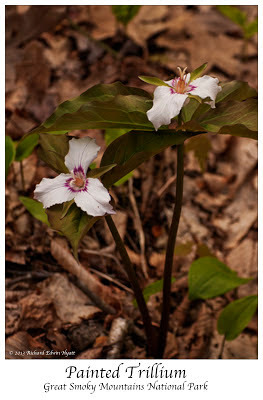 You can find Painted Trilliums elsewhere in the Smokys. You will just have to search likely areas. I know I will be looking for them, too.